What is it about? 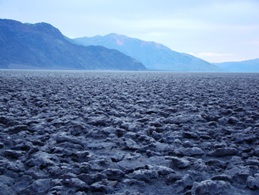 Death Valley is possibly the most spectacular geologic exposure in the entire western United States. The oldest rocks and fossils are found here, as well as rocks from every geologic era. The presence of recently active volcanoes and faults make it an ideal laboratory for the study of structural geology, and the unique animal and plant species allow us to understand adaptation and evolution in a harsh climate. This trip will be a rigorous test of your patience and health. There will be several long driving days, and conditions may become harsh, with rain, snow and wind as serious possibilities (on the other hand, there is fair chance of working on your tan as well!). The success of the trip will depend on your amiability and willingness to put up with inclement conditions. Mandatory pretrip meeting on Thursday, January 31 at 5:30 in the Geology Lab at the Science Community Center, Room 326, on west campus. Contact the instructor (hayesg@mjc.edu) if you cannot attend the meeting.